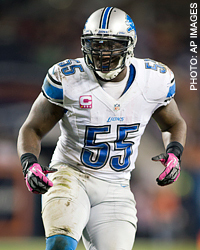 Linebacker Stephen Tulloch has always had an eye toward helping the underprivledged. From his days growing up in Miami to his time in Nashville with the Tennessee Titans to his current days in Detroit, Tulloch has focused on others without looking for any recognition in return. He does get recognized for his contributions despite his best efforts, however, this year receiving the Detroit Lions Robert Porcher Man of the Year award for his off-the-field community service.